Review: Glico Pretz Honey Milk | Oyatsu Break! 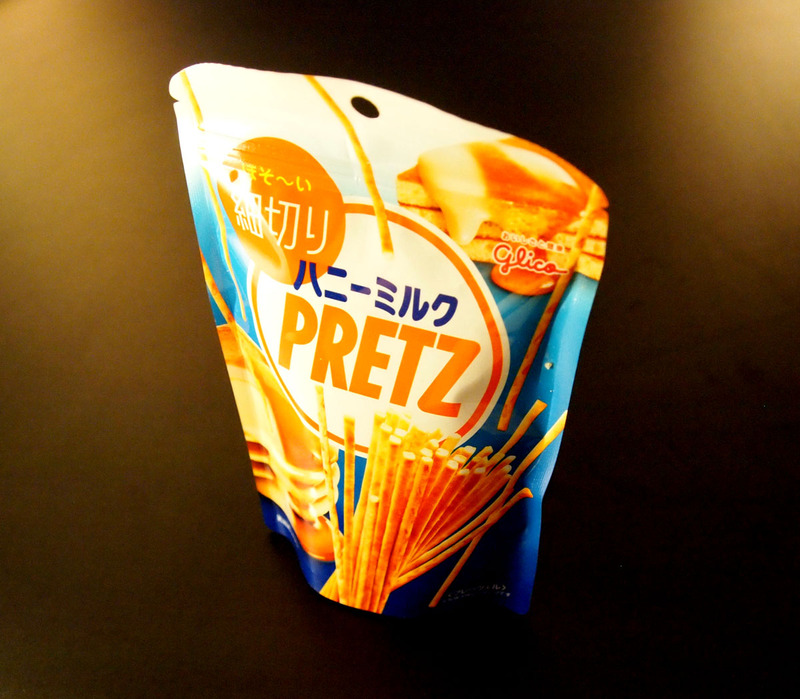 The first Japanese snack food I remember eating was actually Pretz, scooped up from some of the international and Japanese supermarkets where I grew up. 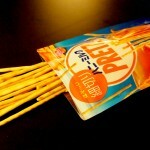 The idea appealed to me more than Pocky–sitting right on the shelf next to it. Why would you get chocolate on a stick, something of which there were umpteen variations of at any given time at the ‘regular’ supermarket, when you could get some sort of amazing breadstick/pretzel thing that was tomato flavoured? Or better yet, Pizza flavoured? No contest. 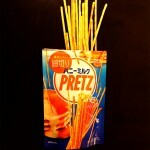 I loved Pretz at first bite. Today I’m trying a new flavour, “Honey Milk” Pretz, far away from the savory tomato/salad delights of the original. 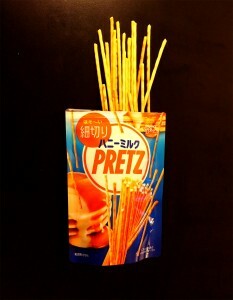 A sweet Pretz flavour that seems like it would be more at home on Pocky than Pretz? Right away I’m suspicious, but in the name of science–and blogging–I’m willing to give it a go. Thanks again to Deb Aoki for the gift! 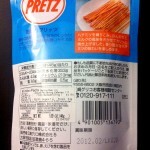 Packaging: Not being able to read Japanese (yes, still, I know, I’m working on it), I had initially assumed that these Pretz were pancake flavoured! Ah, yes, pancakes and syrup, now in convenient Pretz form! It reminded me of other delicious Japanese snack foods that I’d enjoyed. But a careful reading of the English import ingredients label–and some internet searching–revealed that these were “Honey Milk”, not pancake, and I guess the idea is that in Japan pancakes are served with honey and milk on them? There’s clearly still a lot I don’t understand about Japan. A closer inspection reveals that the packaging does actually feature a stack of pancakes with something far more volumous and milky than you might normally find on a buttery pancake, though it resembles nothing I have witnessed accompany pancakes here. Either we need to up our melted-butter game, or that is indeed condensed milk being served on those pancakes. And honey. The packaging is very direct and fairly easy to read, a good use of contrasting colours with orange and blue would really make it pop on store shelves. The photograph of the Pretz–not to mention the excellent printing job, makes it more-or-less clear what’s inside–pancakes not withstanding. Rather than coming in a box with multiple foil packages (like many varieties of Pretz and Pocky), this package is actually a foil pouch, and it’s resealable! What we lose in portion control we more than make up for in extended freshness–a great design and reminiscent of other Japanese bar snacks. Scent: Taking a bit hit of the Pretz smell is a little intoxicating. The base of Pretz is a perfected recipe of baked bread pretezel, and so adding a few sweet scents to the mix creates something really lovely, and big. Also very, very sweet, but not over the top like many of the snacks I’ve tried. It’s grounded thanks to the bread, and a sort of buttery-earthiness that’s coming from the milk (and probably butter). Taste: Great! The Pretz are surprisingly buttery on the tongue, moreso than the standard flavour, and that and the crisp and crunchy texture of the cracker bits are a great palette to serve the sweet and surprisingly savour flavours of the milk and honey. The honey really tastes like honey rather than sugar, and the condensed milk flavour is… it’s hard to put my finger on it, but it’s definitely there and adds a bit of heft to the whole thing. 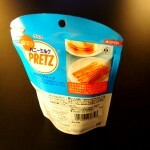 For such a thin little cracker/pretzel/crouton/baked bread thing, there’s an absolute ton of flavour in Honey Milk Pretz! It’s also incredibly addictive, like all of the best Pretz flavours. The aftertaste isn’t bad, you actually mostly just taste the honey rather than any sort of sourness or chemicals you might normally get from heavily processed foods… It definitely encourages you to have another right away, to keep getting hits of flavour. The ingredients list informs me that actual honey was used in making these, which accounts for the flavour. It also says that buttery taste is coming from margarine, which is unfortunate, but it does really bring the snack together… to taste very similar to pancakes. While in Canada we tend to eat our pancakes with syrup instead of honey (and maple syrup at that! ), this condensed milk & honey variation seems like a winner and I’m eager to try it out. Verdict: It’s a great snack. Seriously, excellent. 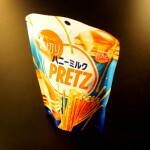 The only weird thing is, and it’s more my fault than the product’s: It’s Sweet Pretz. It just doesn’t seem… right. A quick visit to the Glico website reveals that every single flavour of Pretz out right now is savoury… I don’t think I’d even heard of a sweet Pretz until I received this gift! And given Pretz’s history as a snack to have with beer, I don’t think a sweet version will go over too well with the intended audience. All in all, a great snack that–thanks to the resealable top–I’ll be enjoying for the next month or two.